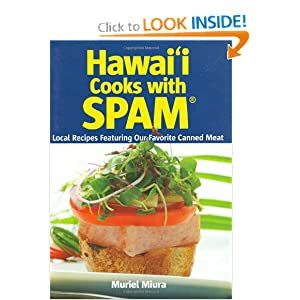 To mak this deep fried spam musubi recipe, measure 4 cups of uncooked rice rinse and cook preferably in a rice cooker following the manufacturers instructions. Generally, 4 cups of uncooked rice and about 4 1/4 cups of water works for me. While rice is cooking, cook spam until golden brown and crispy. Cut Nori(seaweed) sheets in half lengthwise. In a large frying pan, cook the scrambled egg preferably in 1 thin, round sheet that can be cut to size to fit the spam musubi shape. Once the rice is cooked allow the rice to sit in the pot, covered for about 15-20 minutes. Now, mix rice using a rice paddle and add salt, furikake and lightly mix. Do nut over mix or make it too mushy. Put your spam musubi mold in water, then put a layer of rice (about half way up the mold), press down with other mold half, then add spam, then more rice on top. Press again with spam musubi mold press. Remove from mold and wrap with nori. Set spam musubi in refrigerator for 30-60 minutes to allow it to set slightly. Beat two eggs with 1 tablespoon water added to bowl. Pour panko crumbs in another bowl. Dip spam musubi in egg wash, then panko breading. Gently lay musubi in hot oil and flash fry for about 2 minutes. Drain spam musubi and allow to cool for 5 minutes. Cut spam musubi diagonally and plate. Finish with thickened teriyaki sauce or mayonnaise. Garnish with green onion. Serve deep fried spam musubi with shoyu or a tempura dipping sauce if you prefer. I love the crispy contrast from the deep frying and the soft goodness and saltiness of this deep fried spam musubi. No nutritional information available for this deep fried spam musubi recipe.